by P. J. Tracy | Mystery & Thrillers | This book has not been rated. 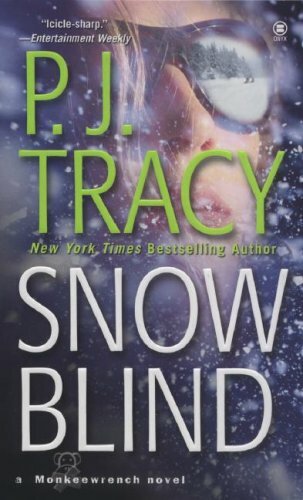 At the start of the exciting fourth Monkeewrench thriller (after 2005's Dead Run) from Tracy, the pseudonym of a mother-daughter writing team, two of the series' staples—Minneapolis police detectives Leo Magozzi and Gino Rolseth—are on hand for a snowman-building contest their department is sponsoring in a local park. The contest turns into a double murder investigation after the frozen bodies of two policemen turn up inside two of the snowmen. Meanwhile, computer expert and ace crime solver Grace MacBride, who has a loving relationship with Magozzi, and the rest of her high-powered Monkeewrench gang are called in for help when a rookie female sheriff in rural Dundas County runs across another murdered cop inside another snowman. Grace and company discover trouble on their Web searches through arcane chat rooms—and also find themselves in danger as the bizarre but believable plot unwinds. A bestseller in the U.K., Tracy could well break out in the U.S. with this entertaining effort. Very impressive - I hadn't read any of the other Monkeewrench novels yet, but wanted to read this one and get it away to redhot-brat (requested in my big giveaway some time back....) Hope you enjoy it as much as I did! This is another series where I can't wait to get to the other books!!! Arrived by mail today - Safe & Sound in Minnesota. Thanks for sending.